I never thought that I would ever, "I will go" to this madness ... and I will do it at home! Dada, chick-pea flour noodles became my obsession. Я как счастливый обладатель:) нутовой муки все время нахожусь «в активном поиске» интересных идей для ее применения. Пироги, блины, кексы – все это уже было. Но вот на днях у меня появилось непреодолимое желание сделать домашнюю пасту (по-нашему, лапшу) из нутовой муки, да еще и без специальных агрегатов-девайсов (с помощью скалки). And, you know, I did it! I can tell you, the devil is not so terrible as he is painted - just a little patience! Why chick-pea flour? Because chickpeas - extremely useful product, diet. The unique properties of chickpea due to a large number of minerals, vitamins and trace elements. The beans contain up to 30% of easily digestible protein, 50-60% of carbohydrates (complex), healthy fats, fiber, vitamins B (B1, B2, B3, B5, biotin, B6, V9) and P vitamins, A, E and C.
The glycemic index of chickpea (and flour out of it) - 35, due to a high content of fiber. Also note that the chick is a champion among the other crops on the content of the amino acid methionine, which is necessary for the synthesis of choline, adrenaline and cysteine. Methionine normalizes cholesterol, prevents fatty liver and improves its performance, acts as an antidepressant. On the other beneficial properties chickpeas you can read on the Internet, I turn directly to the recipe. Скажу сразу, сам процесс достаточно прост. Нужно лишь проявить терпение. So, in a large bowl, combine all ingredients (except water; add it in the least, if necessary - the dough should be cool and do not stick to your hands). Замешайте тесто руками, скатайте его в шар. Заверните в пленку и оставьте «отдохнуть» минут XNUMX — XNUMX час. Roll out the dough on a silicone mat, parchment, the board is so thin as it vozmozhno.Chtoby not stick, rolling pin, wrap with cling film, and the surface whenever generously floured. Yes, this will require effort, without a special machine is not easy, but really! You can divide it into a few parts (if it's more convenient) and roll out first one and then the other. And now the fun: cut it lengthwise into thin strips (0,5-1 cm). You can do this with a round knife for pizza (if you have a special knife for the test - even better!). 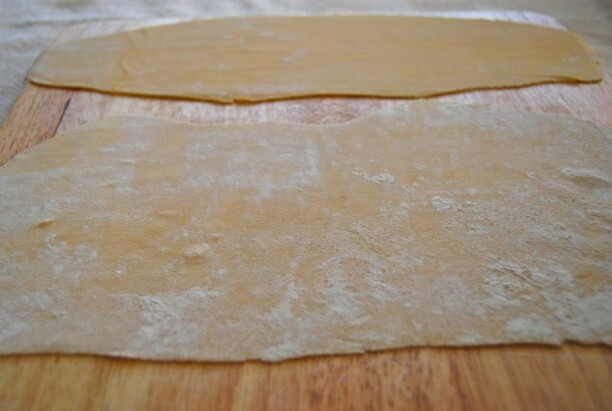 A batter can be folded in several layers (half or 3 layer floured between layers), and cut with a knife - it is much easier than doing the long flat strips of equal width. 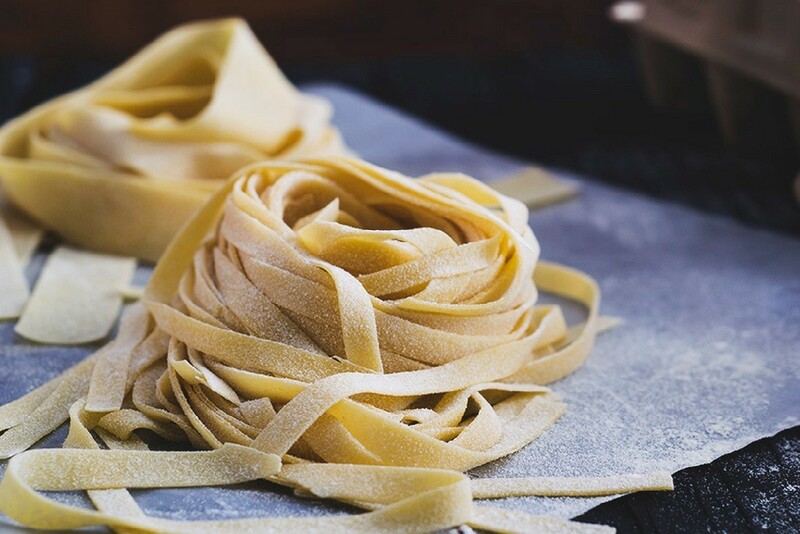 A little sprinkle flour noodles that do not stick together. 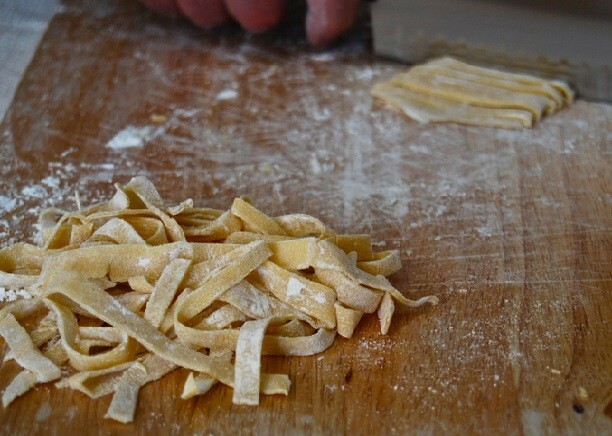 Homemade pasta (noodles) from chick-pea flour is ready. To boil, drop into boiling salted water, need 6-8 minutes.